Advanced formula - cuts through dirt and grime. Silicone free - safe to use near body shop . Environmentally friendly - biodegradable and phosphate free. Free from abrasives - will not damage delicate surfaces. 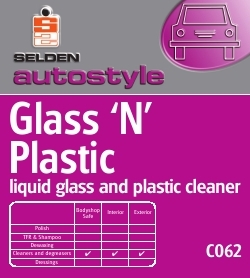 Used in Automotive, transport, display, glazing, office and graphic establishments. Product is formulated to be used on: GLASS: Windscreen, mirrors, windows, coach and bus windows also glass shelves, picture glass etc. PLASTIC: Computer V.D.U. 's, terminals, instrument covers etc. Can be used on other hard surfaces including ceramic tiles, chrome, porcelain, counters, laminated worktops, cupboards etc. Glass 'n' Plastic is a ready to use product. Apply by either direct spraying onto surface and polishing off or by prespraying cloth, then wiping over and polishing off. Do not apply in hot direct sunshine or near naked flames.